Home / News / Now Shipping! Official Star Wars™ Directors Chairs! Now Shipping! Official Star Wars™ Directors Chairs! 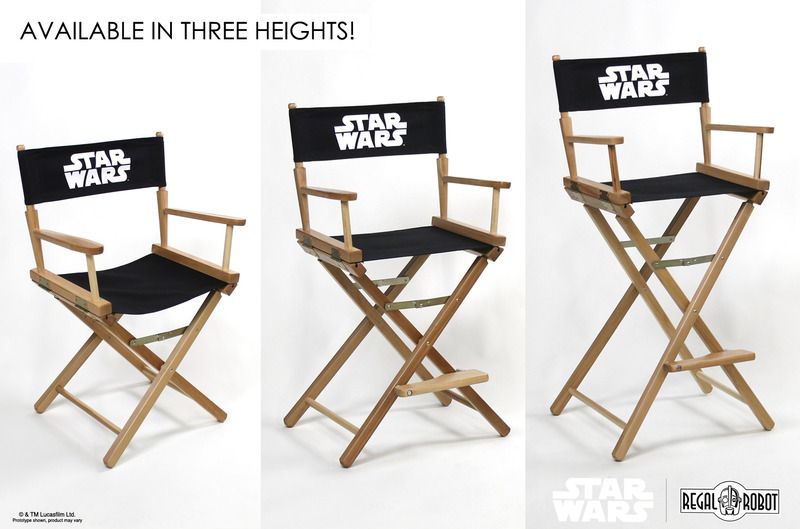 Now Shipping – Official Star Wars™ Directors Chairs by Regal Robot! Sometimes, just a hint of classic movie theming is all a room needs. And what could be more classic than a directors chair? Regal Robot is proud to bring you a full line of official Star Wars directors chairs based on the original trilogy of films. These chairs are now shipping and available for purchase alongside our other authentic Star Wars™ themed furniture and decor products. Perfect for any room in your home or office, these chairs also fold up to make them great for travel, trade shows or even on a set! All of our directors chairs are available in three heights: 18” standard dining chair height, 24” counter height and 30” bar stool height. All of our directors chairs are proudly made in the USA from quality American Beech hardwoods. In fact, our manufacturer has been producing directors chairs for more than a century! Each chair features sleek, straight-line legs with a paddle arm, finished in a low-VOC clear varnish for a natural wood look. The chairs feature hand-fitted, glued, and steel pinned construction and hinges that make it easy to fold the chair up for moving and transport, or simply to store flat when not in use. The 24″ and 30″ seat height models include a footrest for additional comfort. The seats and seat backs are boldly colored heavy duty canvas fabric with silk screened printing. Already have one of our chairs and want to change up your style? We also offer the canvas sets, including a seat and printed seatback, separately for only $29.99! These low cost replacement canvas sets are a great way to freshen up the look of your chair without breaking the bank. Each chair is made from Appalachian Beech Hardwoods from managed forests. Local sourcing of raw materials and domestic manufacturing reduces the carbon footprint from transportation. Low-VOC finishes are applied through a submersion finishing process help to reduce airborne finish particles, all as part of a commitment to the environment. 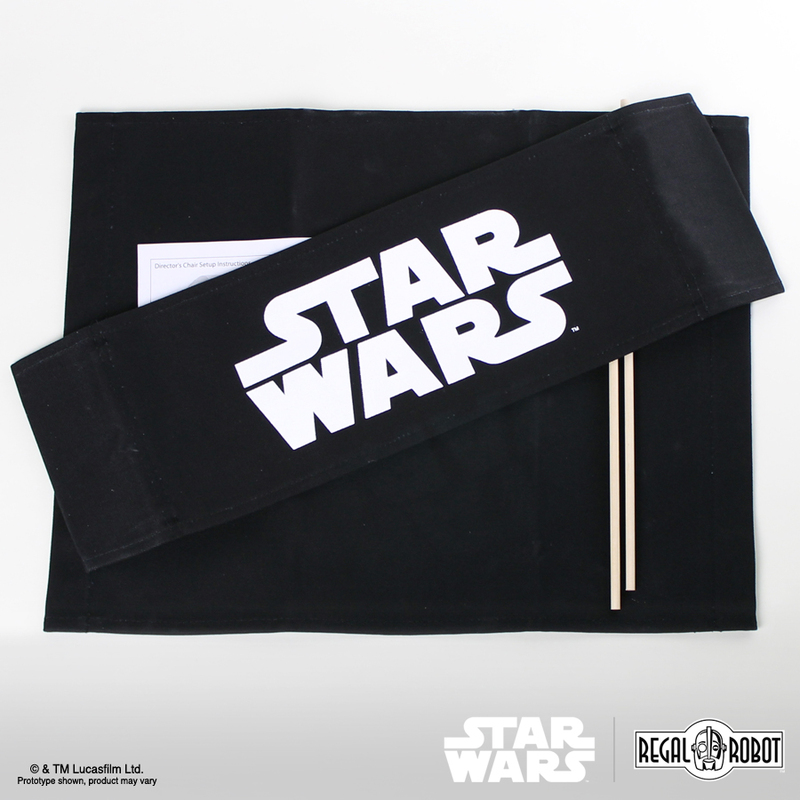 So bring a little of the adventure behind the scenes to your home, office, theater or fan cave with Regal Robot’s official Star Wars director chairs! At Star Wars Celebration Orlando this year, Jordan Hembrough stopped by to talk with Tom about our new director chairs for the Star Wars Show! And remember – We love creating original works of functional art for specific clients who dream as big as we do. Click here to make learn more about our unprecedented Custom Studio Services or make your custom Star Wars furniture or decor request here today!